The Automatic Transmission (A/T) in your vehicle is electronically controlled to produce maximum power and smooth operation. The recommended operating procedures for this transmission are shown on the following pages. Follow these procedures for maximum vehicle performance and driving enjoyment. Do not depress the accelerator pedal while shifting from P (Park) or N (Neutral) to R (Reverse), D (Drive), 2 or 1. Always depress the brake pedal until shifting is completed. Failure to do so could cause you to lose control and have an accident. The cold engine idle speed is high, so use caution when shifting the transmission into a forward or reverse position before the engine has warmed up. Avoid revving up the engine while the vehicle is stopped. This could cause unexpected vehicle movement. Do not downshift abruptly on slippery roads. This may cause a loss of control. Never shift to either the P (Park) or R (Reverse) position while the vehicle is moving forward and P (Park) or D (Drive) position while the vehicle is reversing. This could cause an accident or damage the transmission. Except in an emergency, do not shift to the N (Neutral) position while driving. Coasting with the transmission in the N (Neutral) position may cause serious damage to the transmission. Start the engine in either the P (Park) or N (Neutral) position. The engine will not start in any other position. If it does, have your vehicle checked by a NISSAN dealer. Shift into the P (Park) position and apply the parking brake when at a standstill for longer than a short waiting period. Keep the engine at idling speed while shifting from the N (Neutral) position to any driving position. When stopping the vehicle on an uphill grade, do not hold the vehicle by depressing the accelerator pedal. The foot brake pedal should be depressed in this situation. After starting the engine, fully depress the foot brake pedal before moving the shift lever out of the P (Park) position. Keep the foot brake pedal depressed and move the shift lever to a drive position. Release the parking brake, the foot brake pedal, and then gradually start the vehicle in motion. The automatic transmission is designed so the foot brake pedal MUST be depressed before shifting from P (Park) to any drive position while the ignition switch is in the ON position. The shift lever cannot be moved out of P (Park) and into any of the other gear positions if the ignition switch is turned to the LOCK, OFF or ACC position or if the key is removed. Depress the foot brake pedal - Shifting the shift lever to “D”, “R”, “2” or “1” without depressing the foot brake pedal causes the vehicle to move slowly when the engine is running. Make sure the foot brake pedal is depressed fully and the vehicle is stopped before shifting the shift lever. Make sure of the shift lever position- Make sure the shift lever is in the desired position. “D”, “2” and “1” are used to move forward and “R” to back up. Warm up the engine- Due to the higher idle speeds when the engine is cold, extra caution must be exercised when shifting the shift lever into the driving position immediately after starting the engine. le depressing the brake pedal. Push the button A . Just move the shift lever. Apply the parking brake if the shift lever is in any position while the engine is not running. Failure to do so could cause the vehicle to move unexpectedly or roll away and result in serious personal injury or property damage. If the shift lever cannot be moved from the P (Park) position while the engine is running and the brake pedal is depressed, the stop lights may not work. Malfunctioning stop lights could cause an accident injuring yourself and others. After starting the engine, fully depress the foot brake pedal, push the shift lever button and move the shift lever out of the P (Park) position. If the ignition switch is in the OFF or ACC position for any reason while the shift lever is in any position other than the P (Park) position, the ignition switch cannot be turned to the LOCK position. Apply the parking brake when the vehicle is stopped. Place the ignition switch in the ON position while depressing the foot brake pedal. Move the shift lever to the P (Park) position. CAUTION To prevent transmission damage, use the P (Park) position only when the vehicle is completely stopped. Use the P (Park) position when the vehicle is parked or when starting the engine. Make sure the vehicle is completely stopped. The brake pedal must be depressed and the shift lever button pushed in to move the shift lever from N (Neutral) or any drive position to P (Park). Apply the parking brake. When parking on a hill, apply the parking brake first, then shift the shift lever into the P (Park) position. CAUTION To prevent transmission damage, use the R (Reverse) position only when the vehicle is completely stopped. Use the R (Reverse) position to back up. Make sure the vehicle is completely stopped before selecting R (Reverse) position. The brake pedal must be depressed and the shift lever button pushed in to move the shift lever from P (Park), N (Neutral) or any drive position to R (Reverse). Neither forward nor reverse gear is engaged. The engine can be started in this position. You may shift to N (Neutral) and restart a stalled engine while the vehicle is moving. Use this position for all normal forward driving. 2 (Second gear) Use this position for hill climbing or engine braking on downhill grades. Use this position when climbing steep hills slowly or driving slowly through deep snow, sand or mud, or for maximum engine braking on steep downhill grades. Do not shift into the gears when the vehicle speed exceeds the following limits, otherwise the engine may over-rev and cause engine damage. If the battery is discharged, the shift lever may not be moved from the P (Park) position even with the foot brake pedal depressed. Place the ignition switch into the LOCK position and remove the key. Remove the shift lock release cover using a suitable tool. Push down the shift lock release using a suitable tool. Push the shift lever button A and move the shift lever to the N (Neutral) position while holding down the shift lock release. Place the ignition switch in the ON position to unlock the steering wheel. The vehicle may be moved to the desired location. 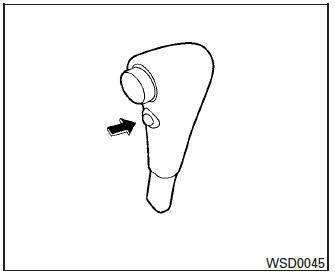 Replace the removed shift lock release cover after the operation. If the shift lever cannot be moved out of the P (Park) position, have a NISSAN dealer check the automatic transmission system as soon as possible. For passing or hill climbing, depress the accelerator pedal to the floor. This shifts the transmission down into a lower gear, depending on the vehicle speed. When the fail-safe operation is activated, the automatic transmission will be locked in third gear. Place the shift lever in the P (Park) position. Place the ignition switch in the OFF position and wait for 3 seconds. Then place the ignition switch back in the ON position. The vehicle should return to its normal operating condition. If it does not return to its normal operating condition, have a NISSAN dealer check the transmission and repair it if necessary. Each time your vehicle is started, the transmission is automatically “reset” to overdrive ON. ON: With the engine running and the shift lever in the D (Drive) position, the transmission upshifts into Overdrive as vehicle speed increases. Overdrive does not engage until the engine has reached operating temperature. OFF: For driving up and down long slopes where engine braking is necessary push the Overdrive switch once. The O/D OFF indicator light in the instrument panel comes on at this time. When cruising at a low speed or climbing a gentle slope, you may feel uncomfortable shift shocks as the transmission shifts into and out of Overdrive repeatedly. In this case, depress the Overdrive switch to turn the Overdrive off. The O/D OFF indicator light in the instrument panel comes on at this time. When driving conditions change, depress the Overdrive switch to turn the Overdrive on. Remember not to drive at high speeds for extended periods of time with the Overdrive off.